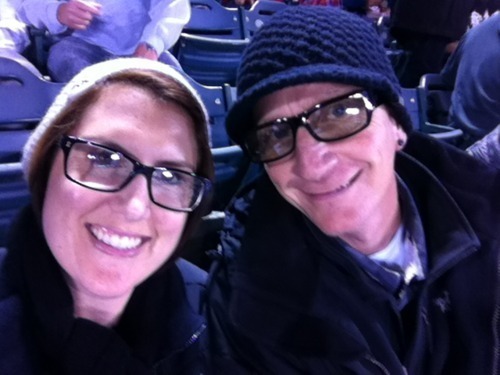 On Saturday night Manfriend got to enjoy his big Christmas gift from me…tickets to the season opener of AMA Supercross at Angle Stadium. My parents have been taking me to these events since I was a little kid, and I remember sitting in the freezing cold and rain some years. It’s our signature face. Go with it. Some highlights of the evening: Blue Moon on tap, me spilling my precious Blue Moon on myself and the chair in front of me during the National Anthem (hey, I wasn’t ready for the fireworks), Villopoto winning the 450’s, Dungey taking a KTM to the podium, Bubba crashing and missing the podium, “old” guys (Windhamn) racing, double shots at the hotel bar. It was a great night, with some great races. 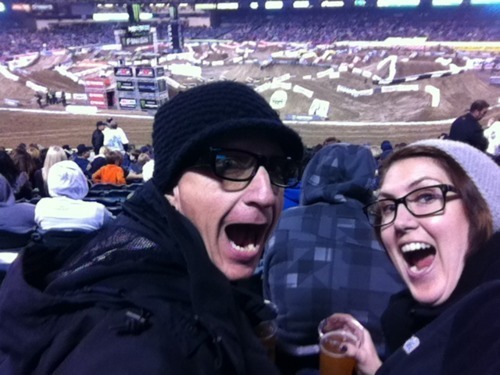 Manfriend really love Supercross, and I’m a fan so it’s nice that we can enjoy the races together. Plus, I’m a pretty cool girlfriend to score seats on the Start/Finish side and we had a perfect view of the holeshot. Win!